for veterinary treatment need to be updated. support for updated standards, if appropriate. Kentucky Derby on May 2, 2019. 63% between 2009 and 2017.
such as lamps, and picture frames. work and art shows with help from his wife Janet. Get out and enjoy all the beauty & tranquilitySierra Madre has to offer! in Eagle, Idaho, and returned to our Sierra Madre home. downsizing, upsizing or moving out of state. Call Eileen626.278.0187Eileen BensonCall me for a FREE consultation on your home’s market value! NRT LLC. Coldwell Banker and the Coldwell Banker Logo are registered service marks owned by Coldwell Banker Real Estate LLC. 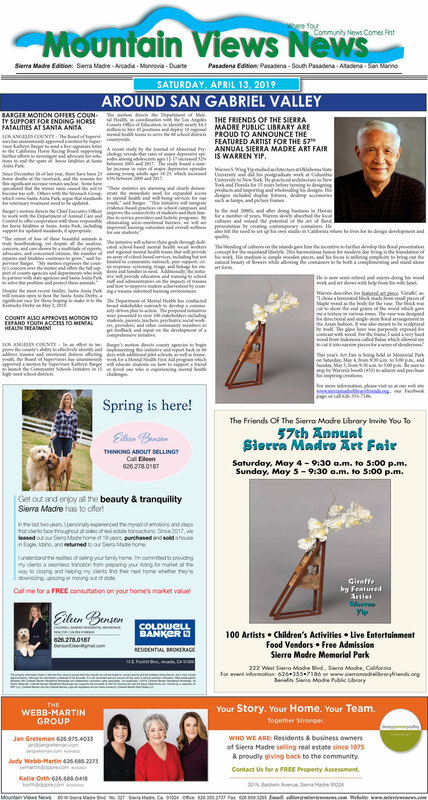 Sierra Madre Art FairSaturday, May 4 – 9:30 a.m. to 5:00 p.m.
Sunday, May 5 – 9:30 a.m. to 5:00 p.m.